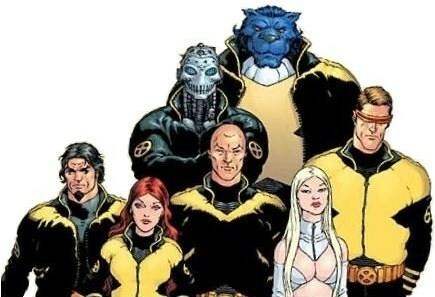 There was a relatively brief time Grant Morrison did some work for Marvel. It was short but wonderful, with his, "New X-Men," being a tour de force and in my opinion the best X-Men comics ever (which people take umbrage with when I state, but oh well). Morrison's X-Men was stellar and still has a lot of popularity to this day, with many folk remembering it fondly. 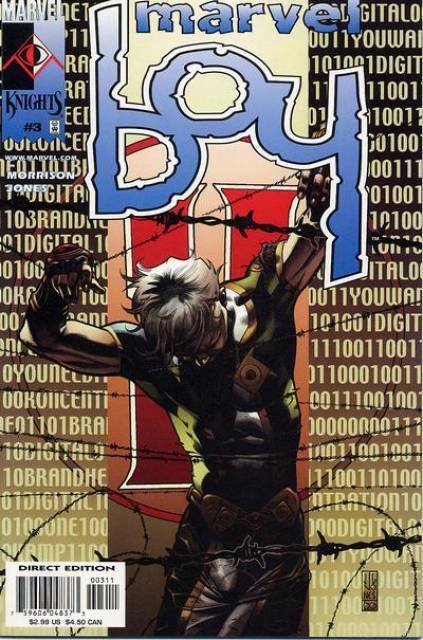 Morrison actually did other things for Marvel too, however, creating a character who has been through quite the creative-wringer since his introduction by Morrison, Marvel Boy. It wasn't exactly a hit seeing as how I was able to find one of my favorite issues from the mini--the third--in the dollar bin. 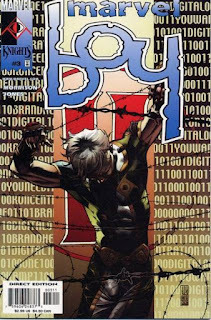 Grant Morrison's, "Marvel Boy," at first wasn't clearly taking place in the Marvel Universe--at least not the main, "616," one we all know. Some people said it was clearly hinting at being in the Ultimate Universe or its own place. Later on he was tied into the main MU, but we'll discuss that toward this piece's end. Anyways, the book was taking place in a world that was Marvel-influenced and featured a young man named Noh-Varr who was a Kree alien that had DNA meshed with that of cockroach and traveled through various dimensions with a science-team. At the start of the first issue they end up on Earth and almost everybody dies. From this point Marvel Boy tries to find a way home whilst battling an assortment of odd folk. The third issue involves him fighting what was kind of like DC's anti-life equation when a sentient corporate virus known as Hexus begins trying to take over Earth through marketing and branding. It is a fun joke about capitalism and between lots of explosions Noh-Varr manages to defeat it the only way possible--he sends the details of its marketing strategies and secrets to all the other big competitors. It is funny and the rest of the six-issue mini-series was great too. Then Noh-Varr was basically forgotten about before--deep breath--randomly popping-up in an, "Illuminati," mini-series, fighting the Young Avengers and Runaways during, "Civil War," kicking-around a bit during, "Secret Invasion," randomly joining the Dark Avengers under Norman Osborn, joining the normal Avengers with the new name of, "Protector," and having all of those comics not really do a good job portraying him at all. Thankfully, after all that he popped-up in, "Young Avengers," simply stating he felt he wasn't a good fit for the regular Avengers and that his weird name was a phase (so we could all forget about it). Now he's hanging-out with the Inhumans for some random reason and I'm not reading about him currently because, I mean, it's the Inhumans. Some of the characters he fought appeared in other books too, like Dr. Midas and the Exterminatirx/Oubliette being in that Marvel event everyone just kind-of forgot about, "Original Sin." I quite liked Morrison's introduction of Marvel Boy, and loved how he was portrayed in, "Young Avengers," but most other appearances have been forgettable-to-bad. You can get the original series in trade paperback form at Things From Another World or if you want just individual issues eBay of course works great too. It shouldn't be too hard to get some issues of the book because while it was quirky and enjoyable, since that first appearance most writers (besides Kireon Gillen with, "Young Avengers,") have struggled to know what to do with the character. Therefore, Noh-Varrr is someone with a lot of potential that sadly has rarely been reached. So it goes when we share a...tale from the dollar bin!